Many people thought that the more physically fit you are, the more lean or if you have more muscles, then you will have more stamina and endurance. So in order to maintain that, you must continue to push your body to workout hard, more cardio, weights at the gym. The result? Risk of injury. Runners would tend to develop knee problems. Varicose veins, etc. And even if you stop exercising for only 2 weeks, you can lose that physical fitness- you need to consistently keep it or the weight would just come rolling in. I want to share with you something I find amazing that I noticed my body is experiencing. It is not that I want to gloat- these experiences I find is amazing because today, I am older and have higher fat density with less muscles but I could sustain longer at physical workout because I don’t run out of breath and my heart and lungs don’t pump like they’re going to burst. It started when I rejoined the gym and decide to start to attend classes. At the nudge of my friend who I bumped into the gym, I went into the cardio intensive class with her. To my amazement, I find that I had the stamina and endurance to go through intensive cardio workout that I’ve not done for about few years. Even my friend commented on that. Me, now older and with higher fat content and knee discomfort. Later, I tried back to back classes and was still alright. One day while visiting a friend in Kepong, I decided to drop by the Forest Research Institute (FRIM). I did not bring my sportswear – actually just intended to go for a short hike, take some photos but decided to hike up the hills anyway- with my slippers. Of course at some parts I did pause to catch my breath but after I hike up and came down, I felt as if I did not hike at all. 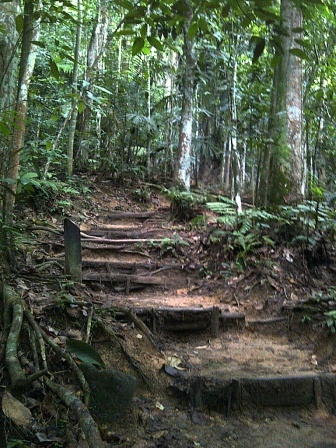 The last time I came here was more than 4 years ago and those times the climb had been streneous for me. 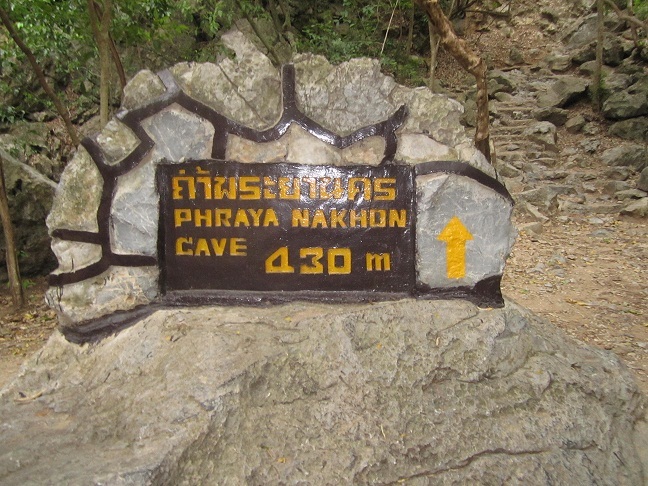 Then recently during my trip to Thailand, we climbed a rock hill- it is a series of steep rocks measuring 430m that you need to climb before reaching the cave. But fortunately, I did not see that signboard below before I started climbing or else it would have made me lose heart. It is definitely not more exercise or strength training. I attributed this change due to wai tan kung that I’ve been doing almost daily. When you see people doing qi gong, tai chi or wai tan kung, you may wonder what’s the big deal that these movements can bring? The movements are gentle and the exercise does not strain a person. But these exercises are nei kung 内功 — meaning they work internally to improve your organs and its function. Qi/chi 气 is an invisible energy flow inside our body- if qi does not flow well, health symptoms would develop. It flows with our blood circulation- and when we do qi related exercises, our qi becomes more pronounced and circulate better to take care of our body and health. Often, teachers of qi related exercises would tell a skeptic that in order to believe it, you have to practice it. Then you would know it for yourself. I used to have horrible sinus attacks that plagued me throughout my school days and working life. It had been a lifelong condition which I had came to accept and I always make sure my tissue supply are well stocked (only use the 3ply tissues). Within 2 weeks of practicing wai tan kung, the sinus went off by itself. If it is not improved qi circulation, then I cannot explain what else because that time the only change I’ve made was to start on wai tan kung exercise. Each day, I rely on the exercises to help me get through the day. For me, the light movements are more effective that cardio, yoga or early walk in the park. And when I rejoin the gym, I am surprised that I got more stamina than people who are more active or skinner than me. Therefore my friends, if you know of any groups around that practices tai qi guan, qi/chi kung or wai tan kung around you- try to join the classes. It is not about age- in fact, the younger you join, the better because you can reap the benefit and prevent any onset of health problems. Athletes would benefit a lot more if they just spend an hour about 3 times a week practicing these exercises- they would definitely perform better in sports, marathons and games, simply because they would not run out of breath and can last longer. Oxygen are circulated more better within the body due to the improved qi movements. If you stop doing cardio exercises for 2 weeks, you can definitely feel your fitness level going off. An active person can gain lots of weight of they stop exercising due to an injury or other demands for their time. Like exercises, if you stop practicing your qi exercises, you would also feel the difference but the effect takes longer to tail off. When I was in Thailand I did not practice but the effects of the exercise had helped me in better endurance and concentration (as most nights I am there I slept only at most about 3 hours a day). Reason why tai chi, qi gong are mostly practiced by older people is because the nature of the exercise is slow paced and you need to focus on the movements and exercises. When we are young, the mind is restless and runs around like a monkey- it somehow would slow down only as we get older and approaching retirement. But if you value your health, give these exercises a try. After all, the fast paced life have given us mostly pressure, weight gain, cardiovascular and other health issues. If we learn to relax, slow down and tame the restless mind, we can find solutions and answers for a lot of questions in a calmed and stilled mind. Perhaps these qi related exercises can help you get there.